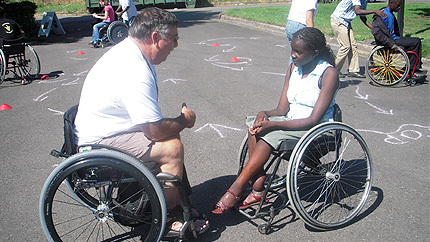 YES student Stella Tiyoy from Kenya meets with a physical therapist and wheelchair user to discuss opportunities to participate in wheelchair sports in the United States. Logged hundreds of hours of community service – at an elementary school, the humane society, an assisted living facility, and a food bank. As this academic year comes to a close, we applaud each student for his and her hard work and many contributions to their American communities. Using what they learned in the United States and their newfound leadership skills, they will strengthen their communities back home and inspire others. They join an active network of alumni of State Department sponsored youth programs-- alumni working towards positive social change, including the full inclusion of people with disabilities, everyday. Watch the video about the YES program's impact on students with disabilities.